(Newser) – “Snowden did not try to mask his identity, or lie to the FBI. He knew he would pay a personal price. As he has,” 15 former staff members of the Church Committee write in an 8-page letter to President Obama. The Church Committee investigated illegal activity by intelligence agencies in the 1970s, and now its experts are asking for leniency for Edward Snowden, the Guardian reports. 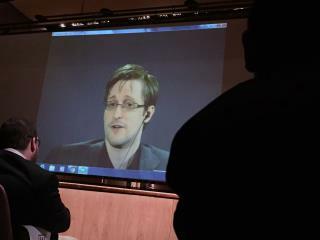 According to the Intercept, the group argues that Snowden, acting selflessly, "stimulated reform" through his actions. The letter writers say that without Snowden, Americans may still not know “what intelligence agencies acting in our name had been up to," TechCrunch reports. Ask Trump. He's your boy. I say.. No Way No How ... It's not gonna happen in any shape or form! & that Movie about him STUNK at the Box office! There ya go ALL! P.S. PREZ TRUMP <-I like the sound of that again! Obama made some comment during his campaign that, ' whistle blowers have importance to free speech,' or something similar. Now he's turned into a paranoid, lock em um A hole worse than Bush. Sadly, this won't happen. And Trump won't either, so these two will languish in foreign countries for years.